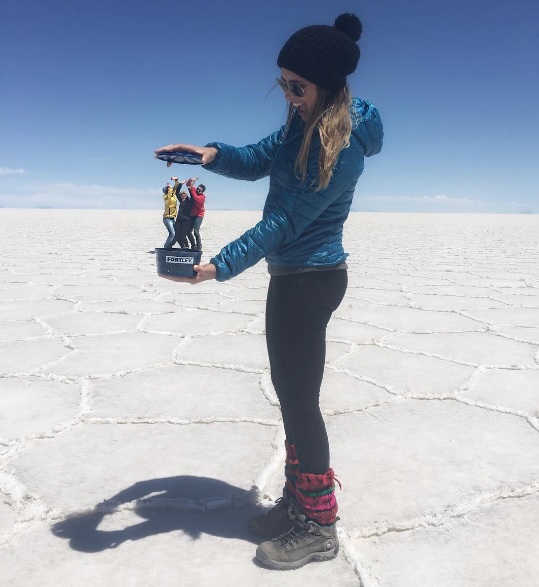 Uyuni salt flats from San Pedro to Tupiza 4D/3N tour. 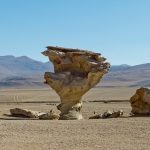 This tour starts in San Pedro de Atacama, Chile and ends on the 4th day in Tupiza, Bolivia. This trip is a treat for the senses with great photography opportunities. 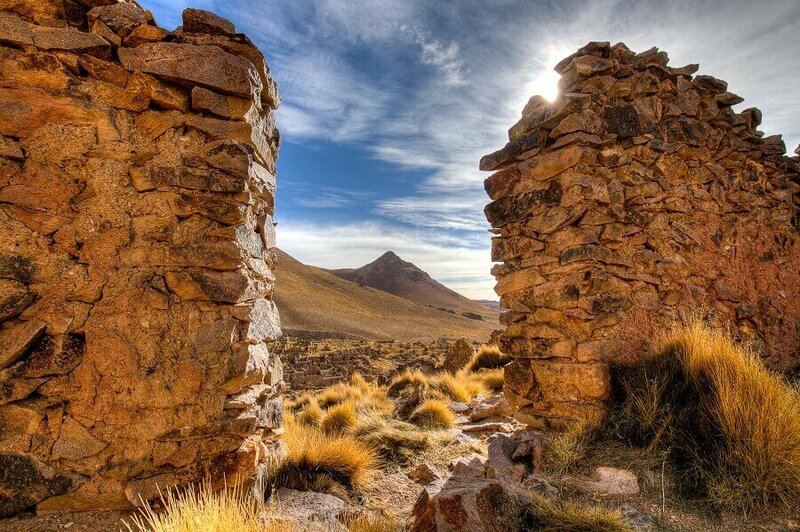 We will pick you up from your hotel in San Pedro de Atacama, Chile and we will take you to the Bolivian border, Hito Cajones. 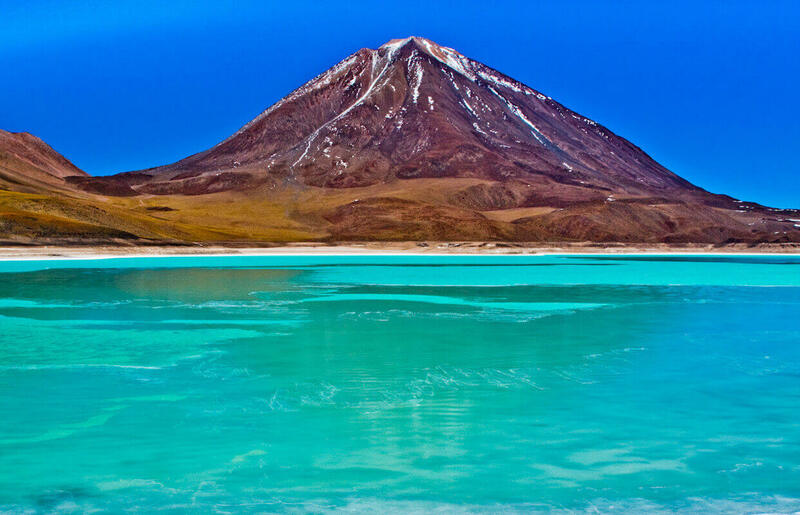 Right after crossing the border, once we arrive in Bolivia we can enjoy a marvelous scenery dominated by the Licancabur volcano and at its feet one of the jewels of the Eduardo Avaroa Reserve (REA): the Green Lagoon which is the first point of our trip by 4X4. This place is like no other in the world. Once we leave the Green Lagoon behind we enter a large landscape: the Valley of the Ladies desert. 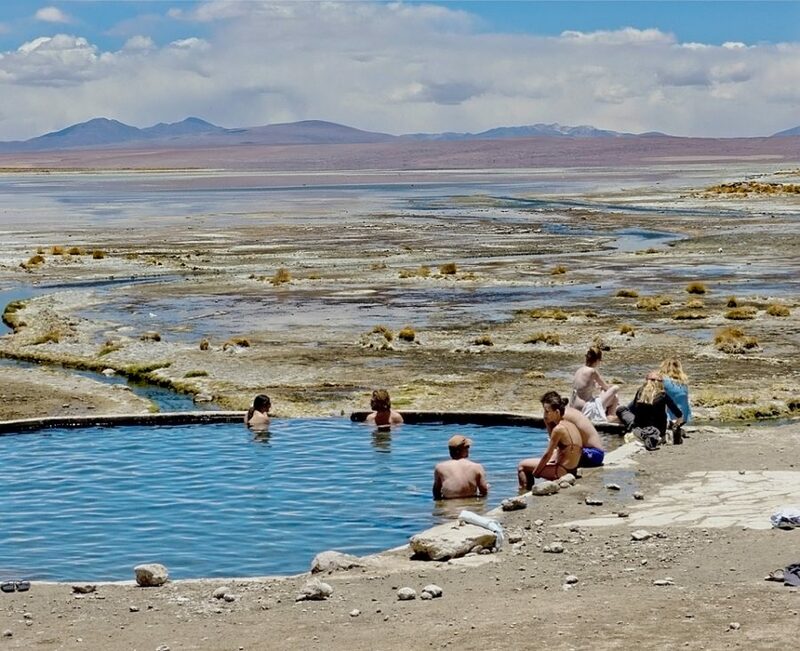 We will continue to the hot springs of Polques where we will have a bath before continuing to the Geysers of Sol de Mañana where we can observe the volcanic activity. 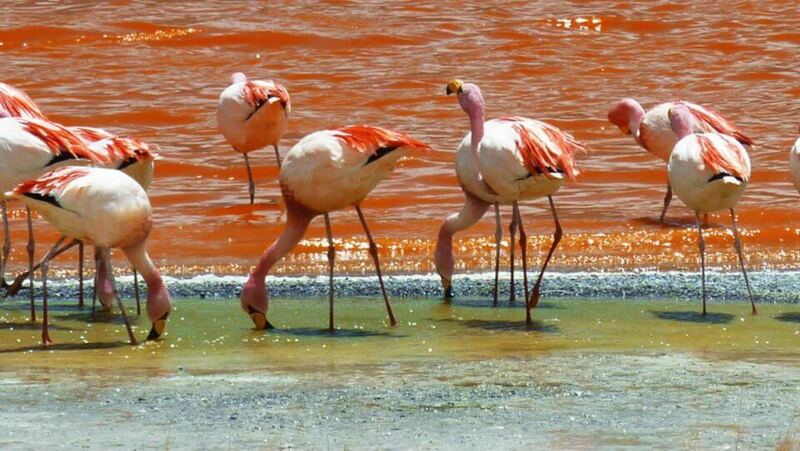 Afterwards we will arrive to the Red Lagoon which is another precious jewel of the Eduardo Avaroa Reserve. This lagoon is the most important place in the area for three kinds of flamingos. 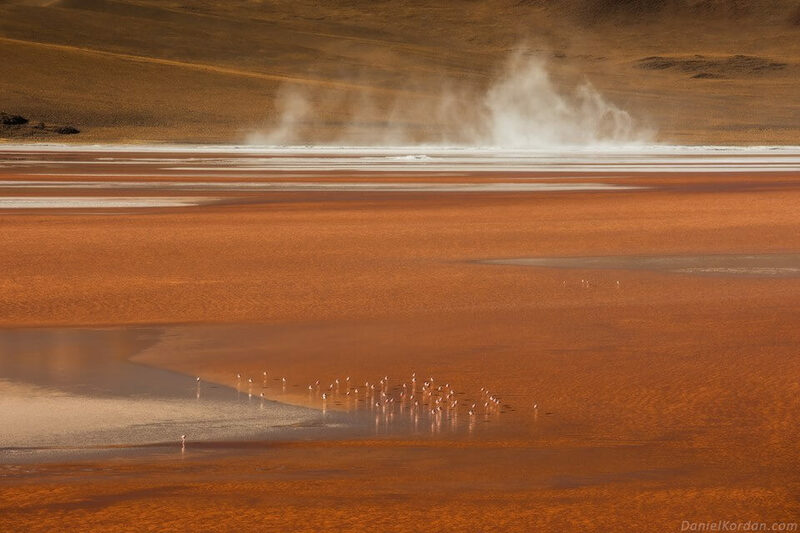 The red color of the lagoon is produced by active algae which react with the sun radiation and wind. The pink color of the feet and feathers of the flamingos is also produced by the same algae, which is their basic food. These fabulous deserts own a great variety of colors as red, orange, ocre, brass, browns and beige. We will visit the Stone Three and on the way we will meet the wild vicuña, camelid with a fine and high figure. 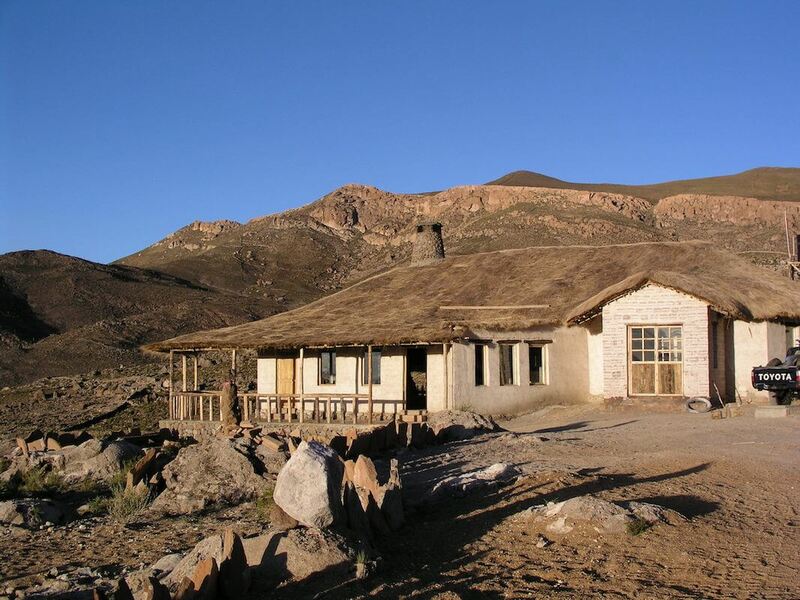 We will continue our way towards Ojo de Perdiz where we will spend the night at the Tayka Desert Hotel (4500 meters above sea level). Today we continue towards Paso del Inca and we drive along small lagoons: Laguna Chiarkota, Laguna Hedionda, Cañapa until we reach volcán Ollague. 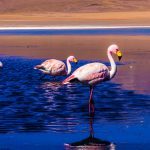 We will be able to spot the three different species of flamingos and other kinds of birds such as Andean seagulls and wild ducks. These birds live on the lagoons surrounded by volcanoes with their eternal snowtops mixed with landscapes full of green and other magic colors due the the presence of borax and sulphur. Afterwards we will visit the Necropolis in San Juan del Rosario and we will enter the Uyuni salt flats. Overnight stay in a Hotel made out of salt. We will enter the Salt Flats at ´Colchani´, where we will stop to visit the salt factory. Afterwards we will stop for a while at the salt mounts and visit the Salt Museum. 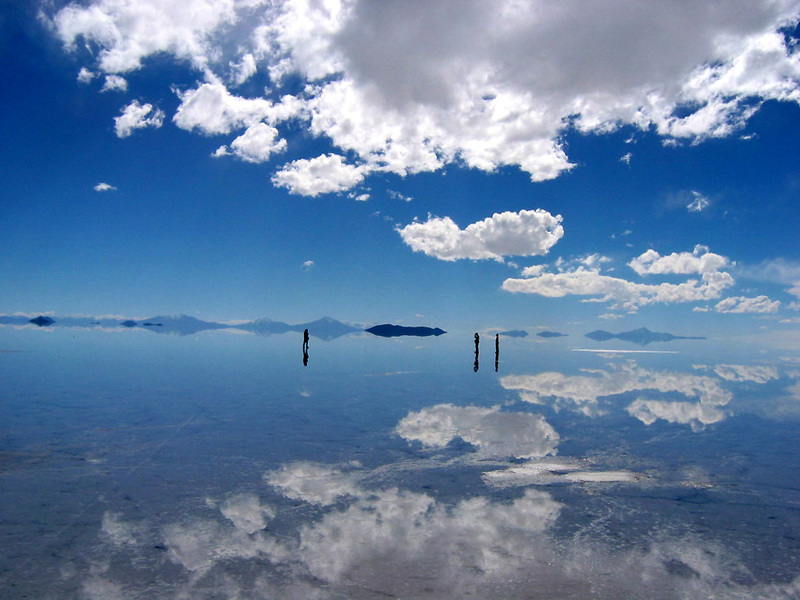 The Uyuni salt flats has 14 small islands, the main one is Incahuasi island located in the middle of the salt flats. The island is made of fossilized coral and consists of 1000 year old cacti. We will follow the path to get to the top of the Incahuasi island. 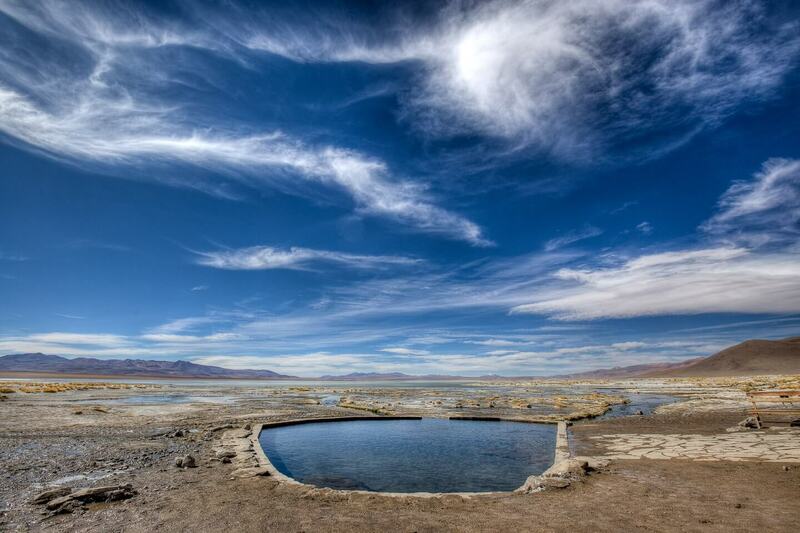 From this point we can enjoy of an amazing 360 º view of the Salar. In the afternoon we will visit San Cristobal village and the train graveyard, with old rusted steel steam locomotives from 1890. Aftwerwards we continue our trip until we get to the feet of the hill San Pablo de Lípez. Overnight stay at Hotel Sumaj Jallp’a (formerly known as Tayka Hotel Los Volcanes). After breakfast we hit the road again to drive through Cerrillos, Polulos and Rio San Pablo towards Nazarenito, a small gold mining village. 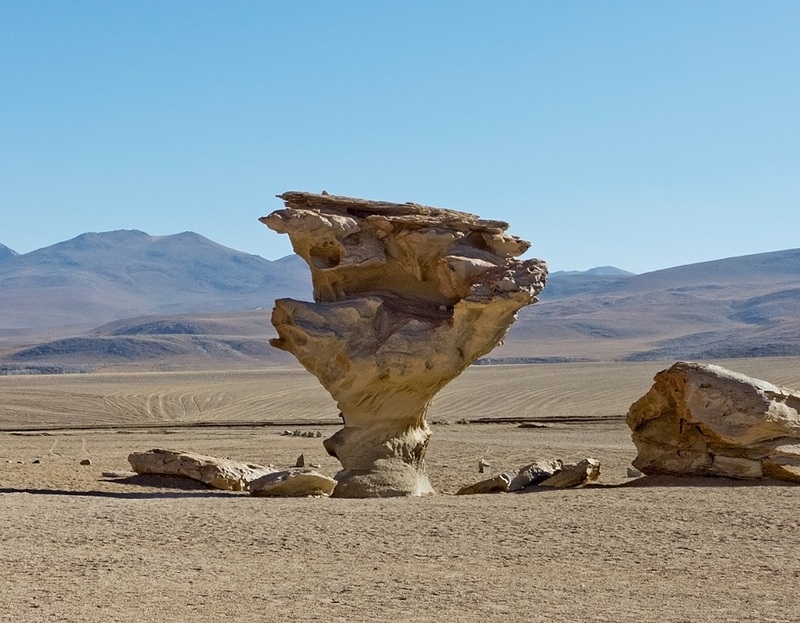 Our next stop is El Sillar (The Saddle) a masterpiece of eroded rock formations, this place is also called Valle de la Luna (Valley of the Moon) because the erosion has certainly caused the countryside to look like a lunar landscape. You can easily pretend you’ve left earth and have gone to the Moon. 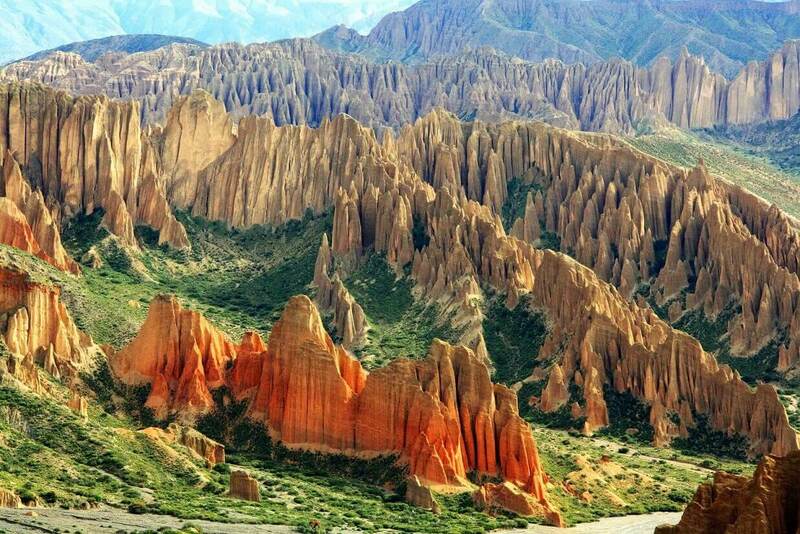 After riding for about 15 km we get to Quebrada de Palala (4200 meters above sea level), one of the most impressive red and pink rock formations around Tupiza. The tall thin rocks look like giant needles. Our trip ends in Tupiza. Rainy season: the rainy season is roughly from January to April (subject to change). 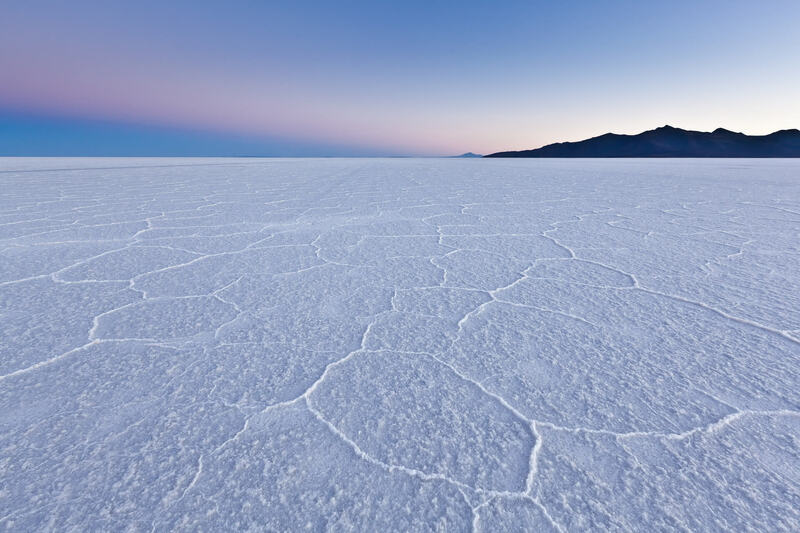 During this period parts of the Salar may be covered with water. It’s still possible to do the trip, to visit the Salar and the beautiful lagoons, the highlights of the trip for most people. 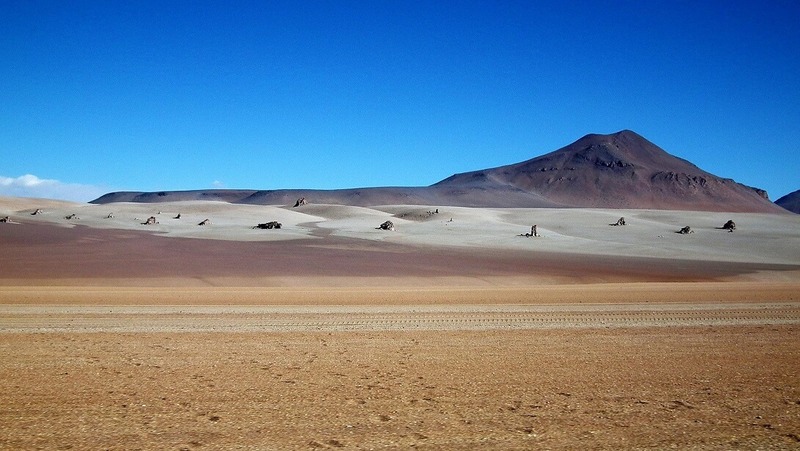 However with water on the Salar you cannot cross it for hours like in the dry season and you generally cannot get to Isla Incahuasi / Fish Island. Also the Tayka Salt Hotel in Tahua (valid for the 4 day trip that starts and ends in San Pedro) can often not be reached during the rainy season therefore we will use another salt hotel like Cristal Samaña, Luna Salada or Palacio de Sal instead. Other places that cannot be visited during the rainy season are Cueva de las Galaxias, Momias de Coquesa and Chantani, but notice that those places are considered to be minor attractions in the area. Some photographers specifically want to visit the Salar during the rainy season as when the Salar is covered with a little bit of water it becomes one big mirror which makes for beautiful pictures. With too much water however the mirror-effect is gone. Needless to say we cannot predict whether or not it will rain before or during your trip, it’s up to Mother Nature. Private transport from Calama in Chile. 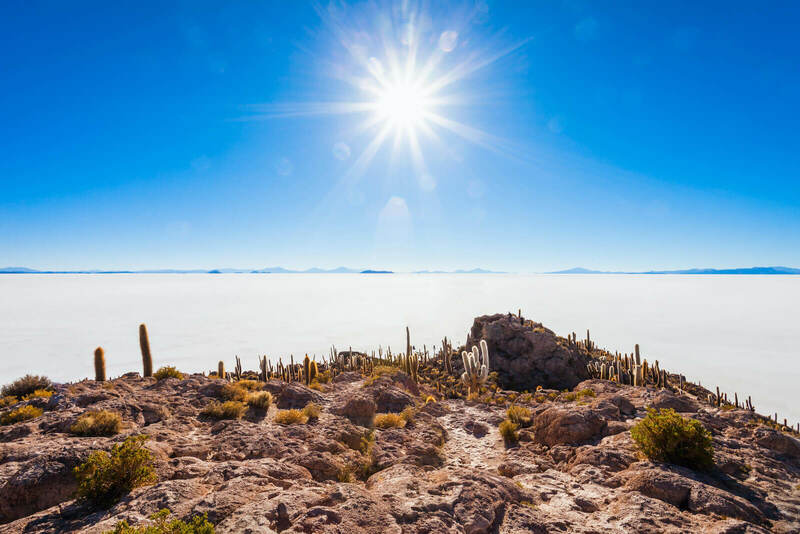 Basic 3 day tour on the Salar de Uyuni, with basic hostels and private transport only.